All-Paid Team of Tomorrow: Who's getting paid next? 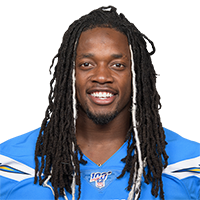 Published: Jan. 6, 2019 at 03:33 p.m.
Los Angeles Chargers running back Melvin Gordon breaks through the line for a 1-yard touchdown, the first TD of the game in Chargers-Ravens. Published: Dec. 22, 2018 at 10:12 p.m.
Los Angeles Chargers running back Melvin Gordon bursts through the line for the game's first touchdown. Published: Nov. 25, 2018 at 05:22 p.m.
Los Angeles Chargers running back Melvin Gordon puts up his second touchdown of Week 12 on a 5-yard run.